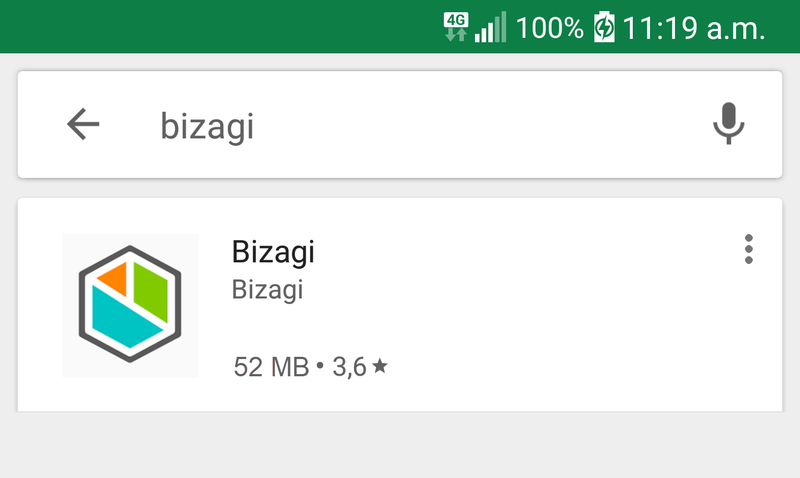 To access a Bizagi application from an Android devices use Google Play (http://play.google.com/) and search for "Bizagi". The application is free for download. Keep in mind that the version of the application installed in the mobile device must be greater than or equal to the Bizagi's version installed on the server where a specific project is executed. Otherwise, the project might not be properly executed. 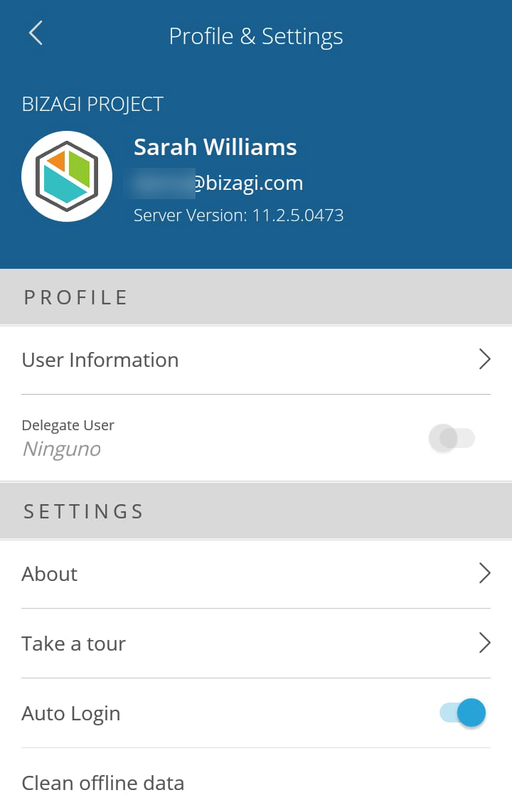 Set the URL in the Server field to access Bizagi project. Then, tap Next. •Domain: the domain to which the user belongs to, as defined by the admin. If the application server has only one active domain, the domain selection is not required. If the application server has more than one active domain, Bizagi will display a list to select the corresponding domain. Keep in mind that the user properties can be obtained from the Work Portal. You can also access a list of previous logins made from the device (Login history) to quickly access their related applications. The list contains the information of the user. Bear in mind that sign in history is not available for Android tablets. 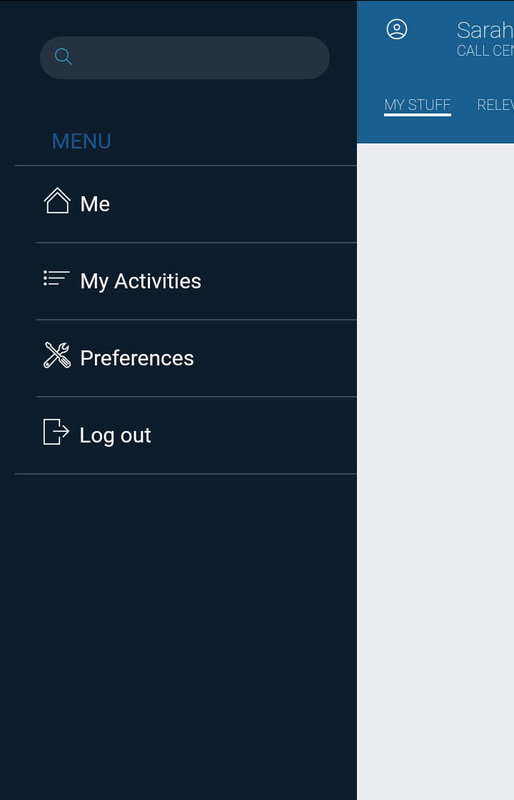 Once signed in, the My Activities screen is displayed by default and depends on the Me Menu configuration for this user to be shown by default. Within Relevant to me tab, you can find all available searches for the current user. Detailed search use can be found in the search section. Bear in mind that when the Add new button is configured for a collection shown in My Stuff, an option will be displayed at the top right of the screen when the collection is open. More information regarding the Add new button can be found in My Stuff article. Nevertheless, these views are switchable (as long as Me applies for the user) through the icon displayed at the top left of the screen. This screen displays the Application options. This option is available through the icon displayed at the top left of the screen. Enables/Disables the Login history feature. 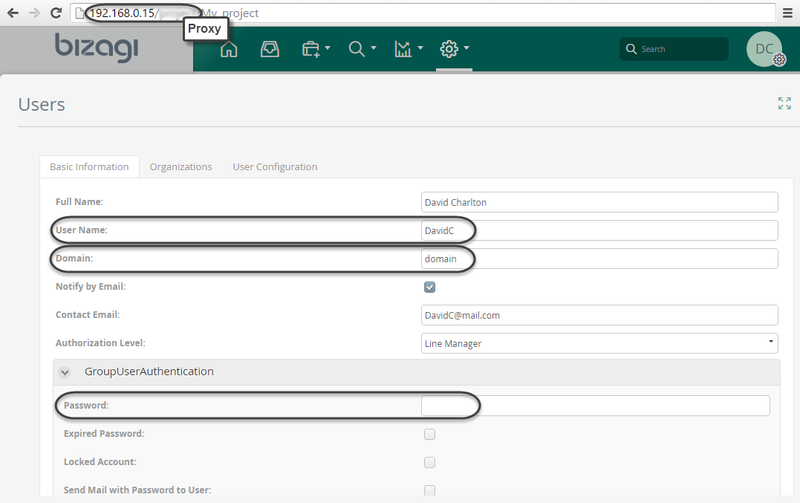 Defines if the password is requested when user access a saved login or not. URL to access your Bizagi project. User name of the logged in user. User password of the logged in user. The domain to which the user belongs to, as defined by the admin. Current Bizagi version of your Bizagi project. 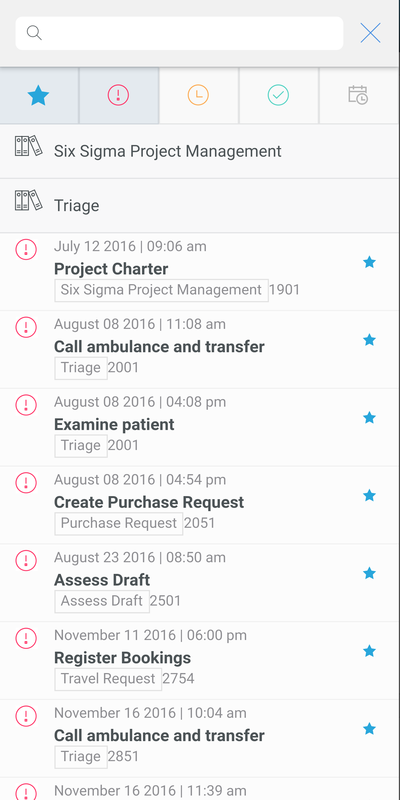 Current Bizagi Mobile App version. 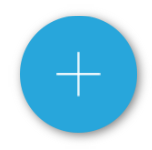 The lowest Bizagi project version supported. The highest Bizagi project version supported. 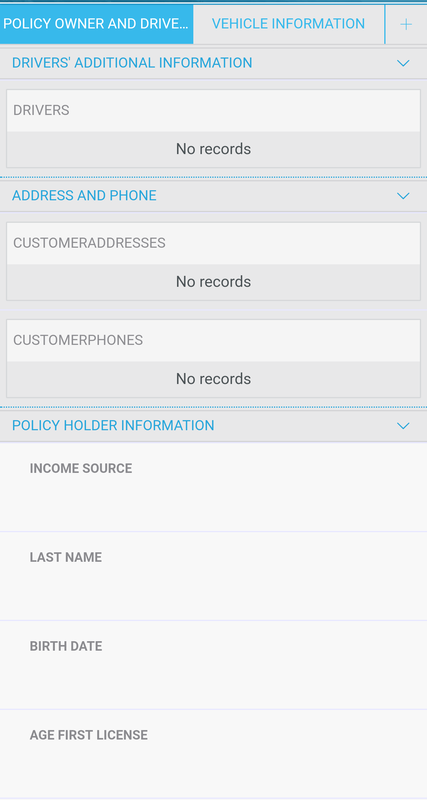 Displays a brief information about Bizagi Mobile App and its functions. 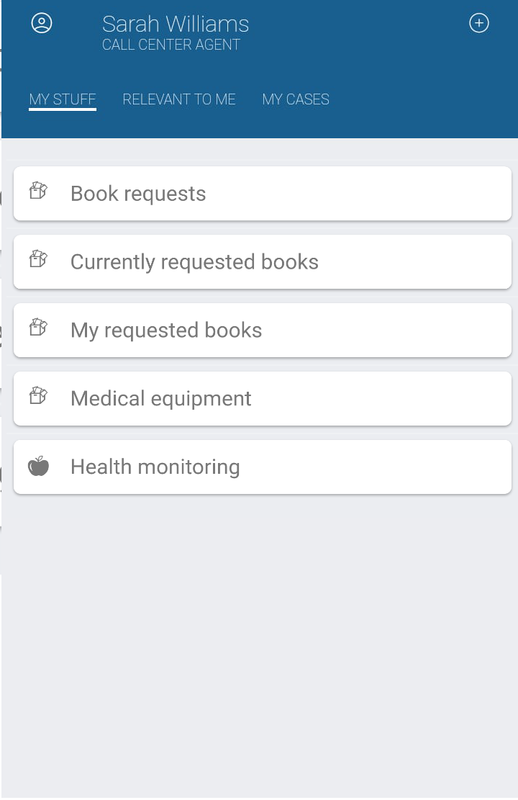 This screen displays the list of all your allocated activities, categorized by due date. •Overdue: Groups activities that are overdue. The due date of these activities is displayed in red. •Today: Groups activities that expire today. The due date of these activities is displayed in yellow. •Tomorrow: Groups activities that expire tomorrow. The due date of these activities is displayed in yellow. •Upcoming: Groups all remaining activities. 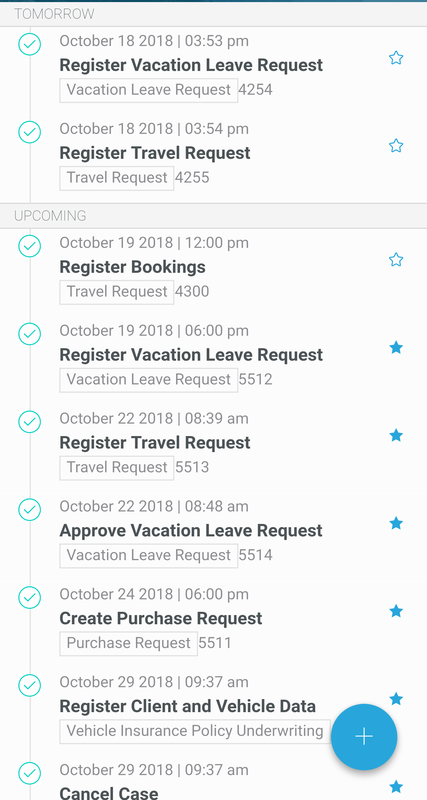 The due date of these activities is displayed in green. To navigate through the cases swipe up and tap Load more option, the cases will be automatically loaded. This feature reloads the displayed cases. 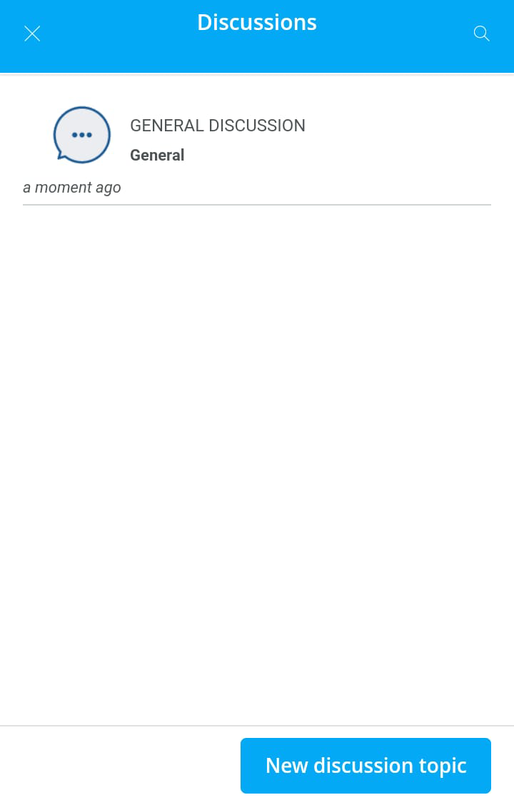 To work on a pending activity, tap it and the activity will open. 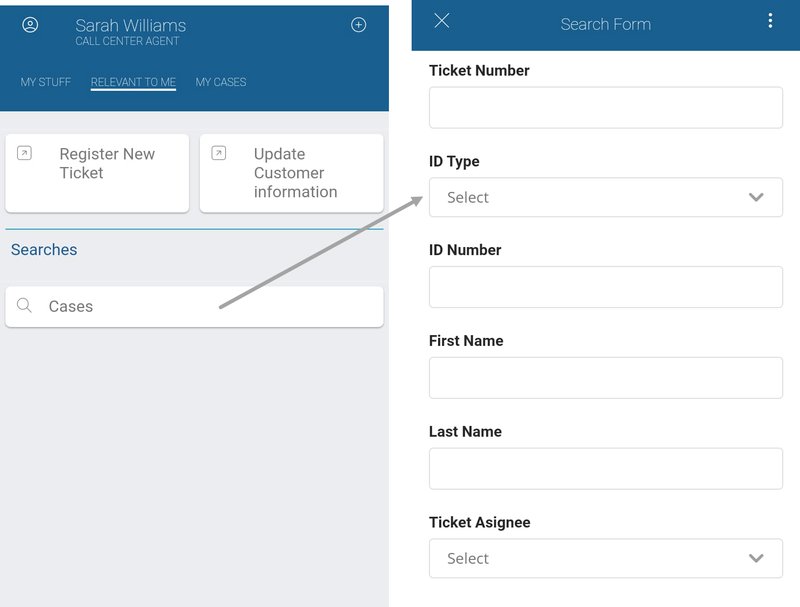 To show the form buttons, tap the ····> button located at the bottom right of the screen. 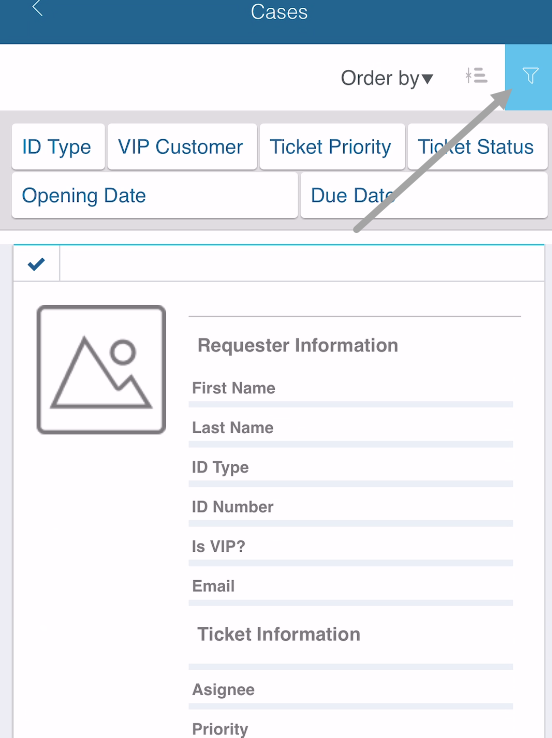 If the process has a summary form, it will be shown with a Work on it button to open the case. 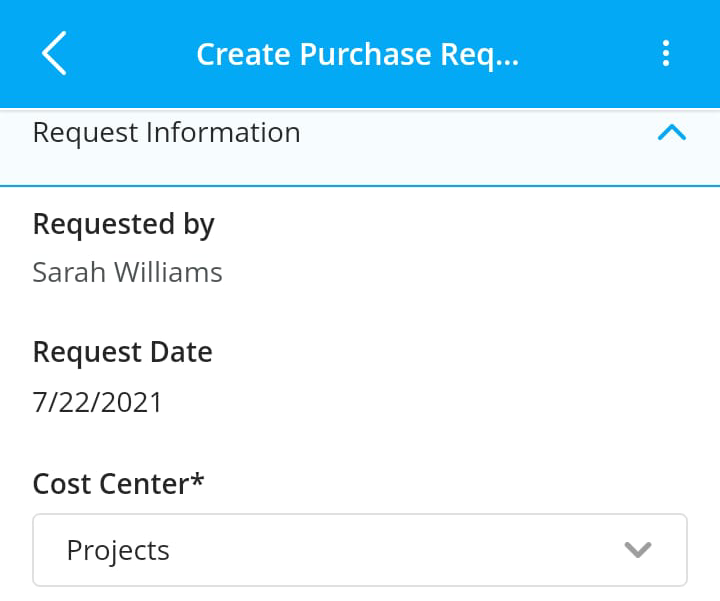 Once selected, the available processes are listed. If the process is not on the list, type in the name of it in the text box. 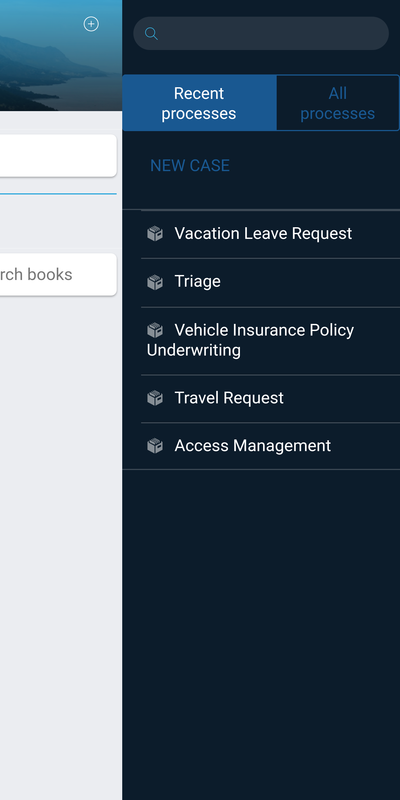 To perform a search over the open cases just select the magnifier icon located at the top of the My Activities. Type the name of the activity or the case number. 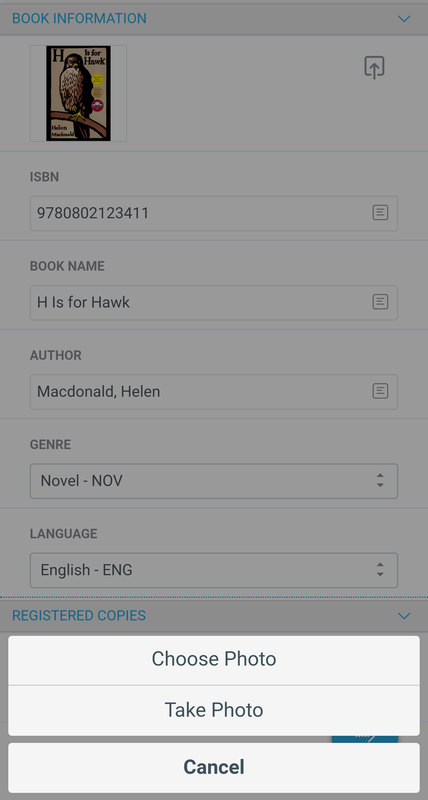 The list of activities that meet the search criteria will display. Note that this search is not the same as the searches configured for a Stakeholder. Through this search you can search for process cases. When searching, every case matching the information provided will be listed. 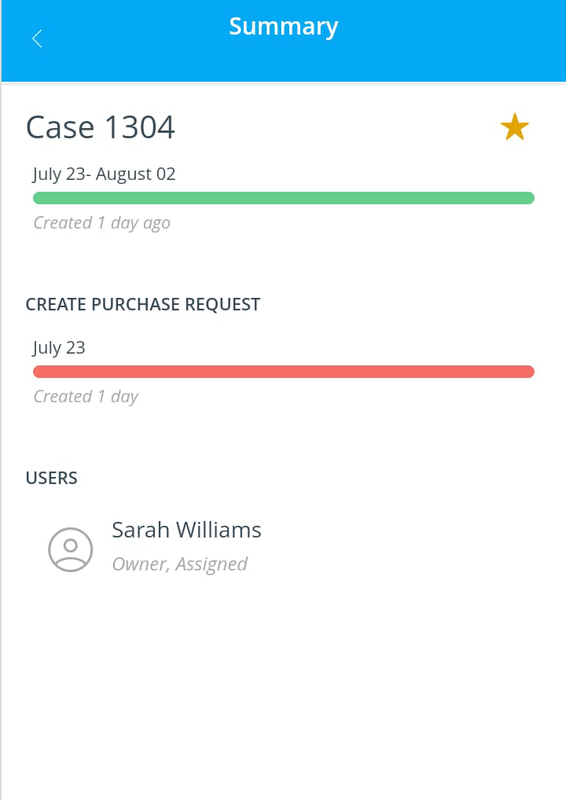 You can filter as well by the case's due time state, if its a favorite case for the user o by a due date range. 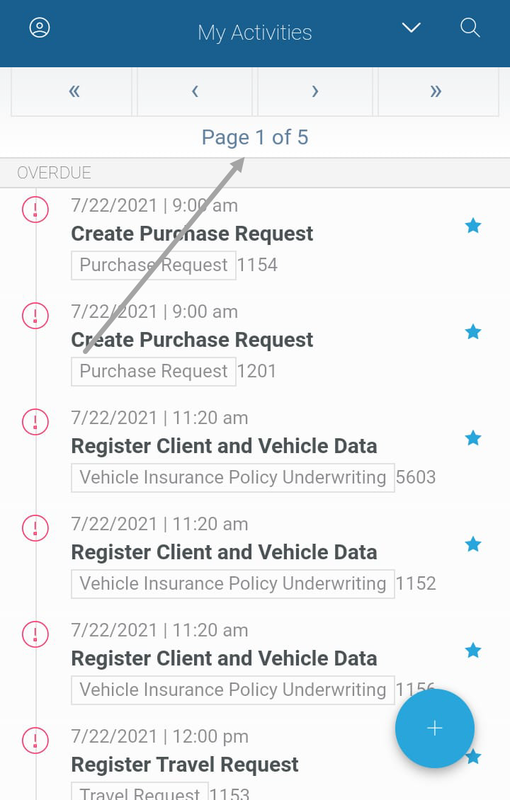 If your intention is not to search cases but use the previously configured Stakeholder's experience searches, Go to Relevant to me in the Me menu, here all defined searches for the stakeholders in which the user has been registered to are listed. When selected, the configured search form will be shown to filter the results. To learn more about experience searches please refer to the Data Searches article. 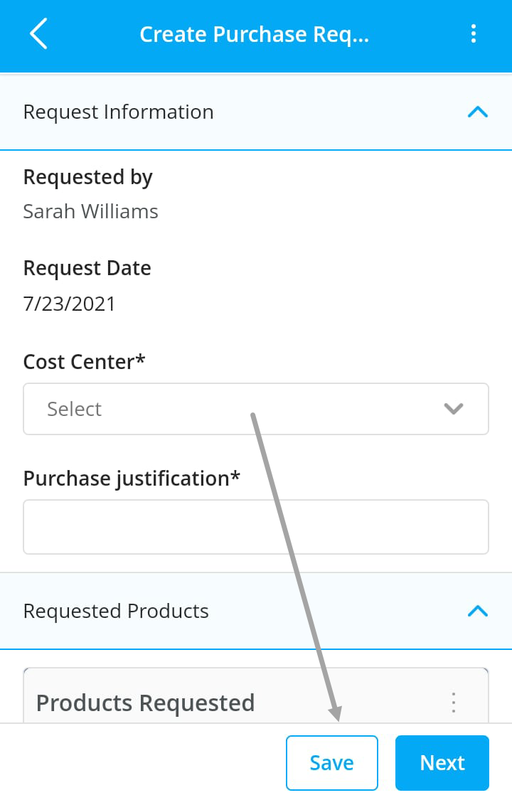 Not all fields must be completed, in fact any of them is mandatory, but if the search is performed the results will show all information stored, otherwise filtered. Nonetheless, once the results are displayed, a new filter can be performed as well as sorting the current results by one attribute. Depending on the current option you are in the main screen, different information or options are displayed when selecting the option at the top right of the screen. 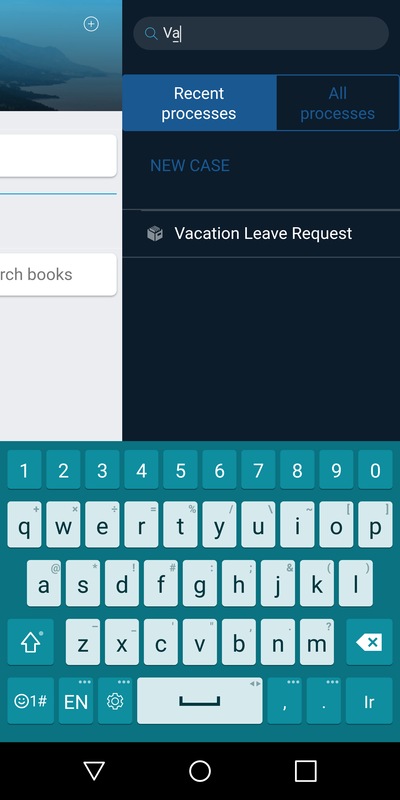 Tap ( ) to search cases while in the My Activities screen. If you tap the ( ) icon when displaying the Me Menu, it is possible to create new cases. •Recent processes: Displays a list with the most commonly used processes. •All processes: Displays a list with all the available applications and its processes. 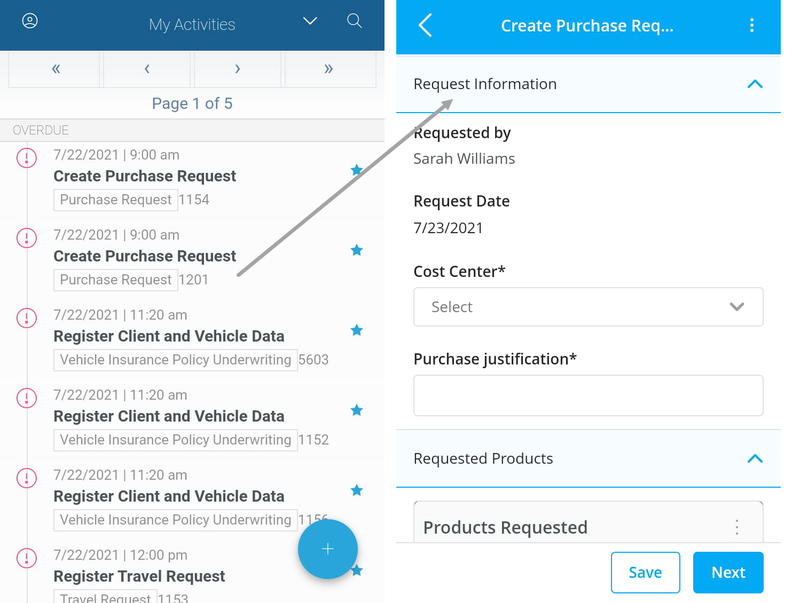 To create a new case just tap the process name or the application to which the process belongs to and then tap the specific process. 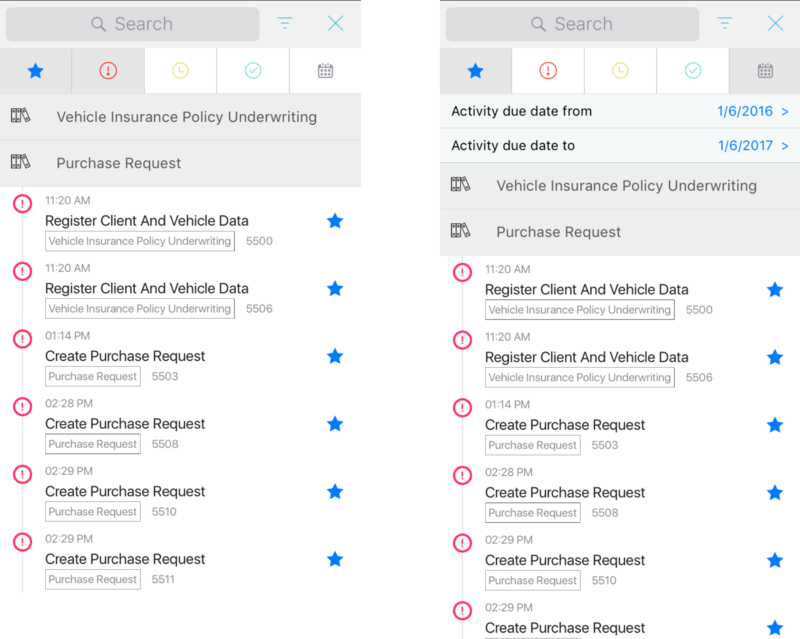 You can use the search field to save time, searching for a specific process when there are a lot of processes to choose from. Every case has some options which can be accessed when selecting the three-line button while still in the case. 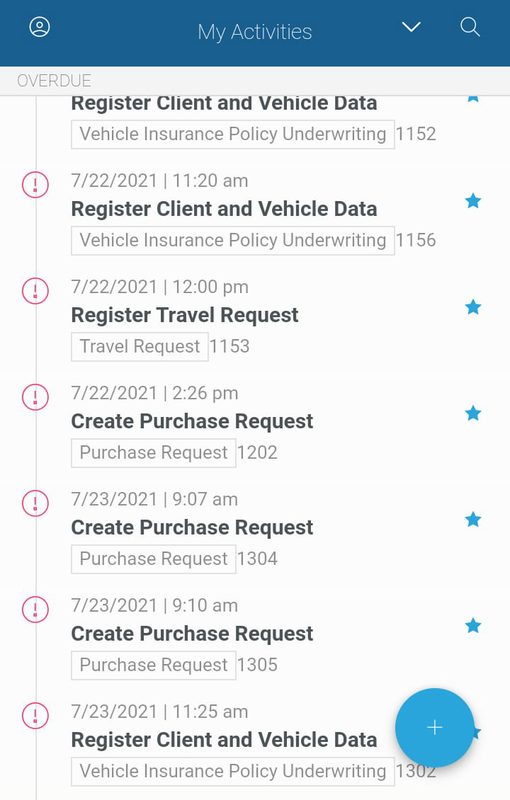 These options are the mobile equivalent to the case folder in the Work portal. 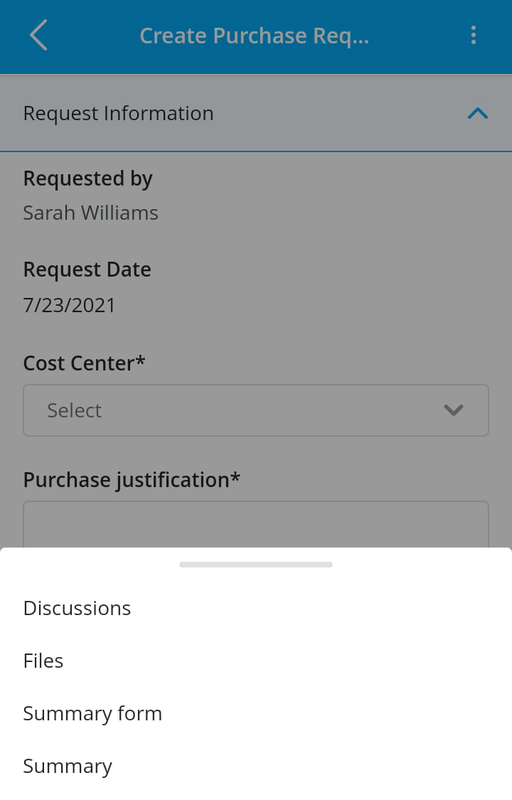 The options are the same, files can be upload directly from your device and discussions can take place for this activity in this case. 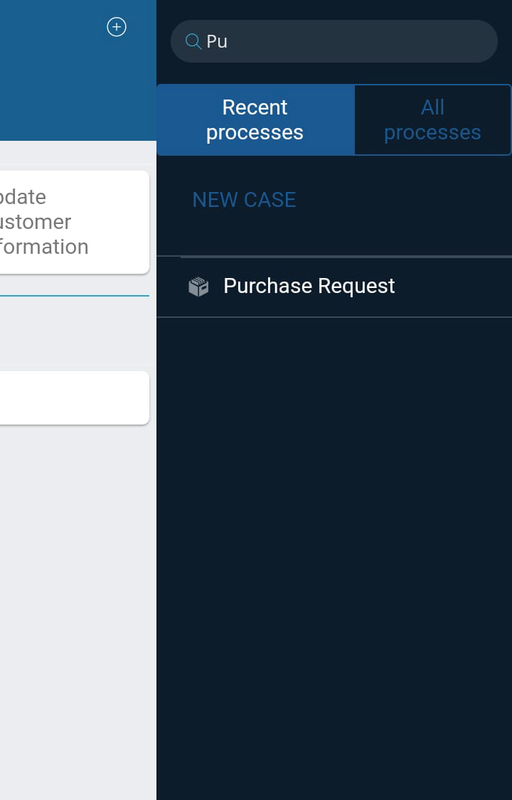 The summary menu will show general information about the case. • allows closing the activity. • displays the case folder. 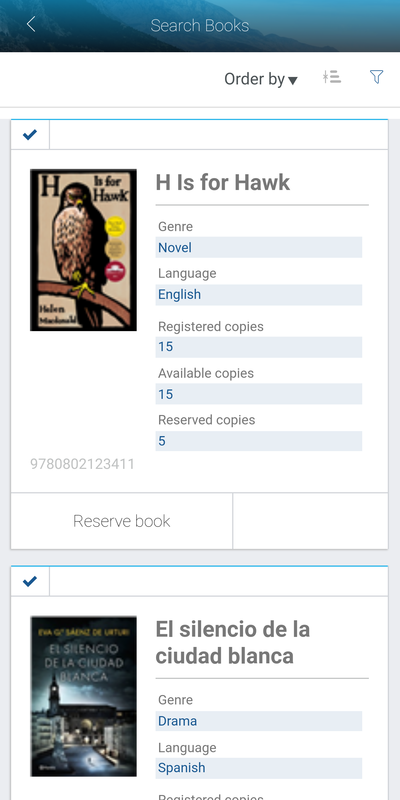 Controls are presented with a modern look to allow the best user experience for easy-app interaction. 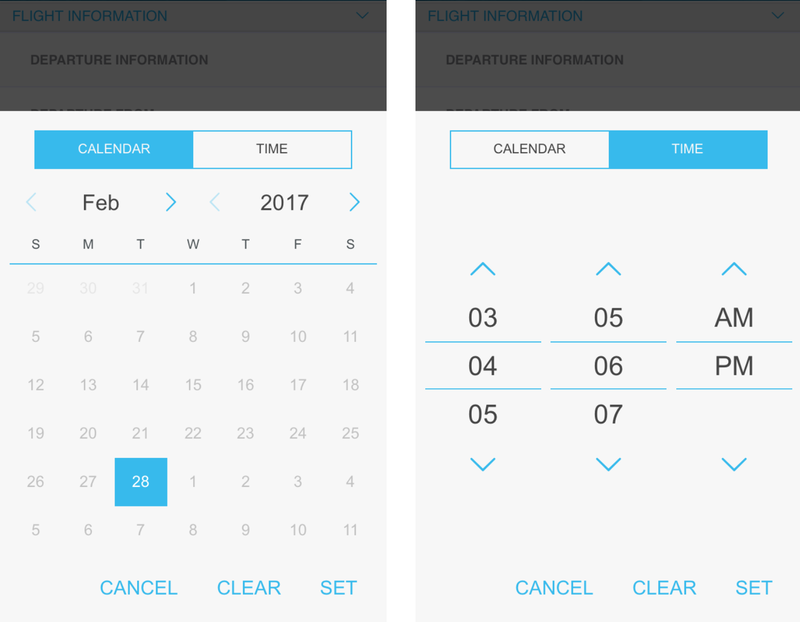 •Date and time controls allow entering information by using the mobile's input menu. 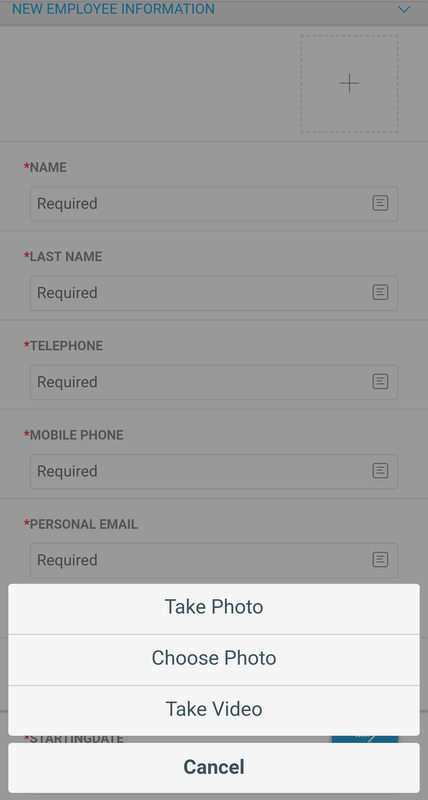 •Image type controls allows taking or uploading photos from your device. •File type controls allow taking or uploading photos, taking videos or recording audios. Preview is only supported for image files types. Otherwise, Bizagi will enable the automatic download.